YouTube is down. YouTube TV is down. YouTube Music is down. This is how the apocalypse starts. Or, at least, there are a bunch of people who don't know how to entertain themselves right now. 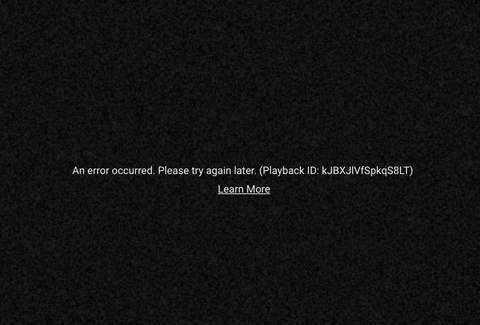 Late Tuesday night, YouTube videos began showing the error screen seen above instead of the usual selection of clips from The Office and YouTubers doing important work like building giant rat traps for humans. At 8:41pm EST, YouTube responded to the spreading complaints, saying the company is "working on resolving" the issue. At the time, there was no update on what might have caused the outage or how many people the outage has impacted. However, judging from reports logged with Down Detector, the issues appear to widespread. Some reports on Twitter indicate the issues are being felt in countries around the world. Naturally, people responded the only way they know how: They took to other social media platforms to complain and make jokes about the outage. Also, it's not clear if someone actually did this or if the Philadelphia Police have pretty low expectations, but you definitely shouldn't call 911 over this situation. That's an extreme overreaction, even if you were in the middle of a game. The deluge of complaints highlights how rare it is for a massive outage like this to take place. Though, YouTube TV did famously go down during the World Cup earlier this year. This story will be updated as more information becomes available from YouTube and Google. Until the service is back up, you can entertain yourself with seasonally-appropriate entertainment by flipping through this list of the scariest viral videos on YouTube. Oh. Wait. Crap. At 10pm, YouTube issued an announcement saying that the site is back up and running.